OSWEGO COUNTY – Oswego County marks its 200th anniversary with a variety of fun fall events in communities around the county. Enjoy great fall fun in Oswego County with a variety of bicentennial events! 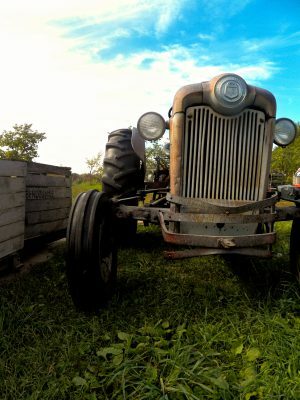 In September, browse antique tractors and engines and learn about the county’s agricultural history with festivals at the Sandy Creek Fairgrounds and along the north shore of Oneida Lake. For more bicentennial events, go to www.visitoswegocounty.com. Photo courtesy of Rachel Geiogamah. Mark your calendar to celebrate in September! • Old Home Days: On Saturday and Sunday, Sept. 3 and 4, come to Old Home Days at the Redfield Volunteer Fire Department on county Route 17. Festivities run from noon to midnight on Saturday and noon to 6 p.m. on Sunday. The parade begins at 6 p.m. on Saturday. For details, call 599-7762. • Working on the Railroad: On Saturday and Sunday, Sept. 3 and 4, the Oswego Railroad Museum on West First Street celebrates Labor Day with its “Working on the Railroad” exhibit. It is open from noon to 5 p.m. both days and there is a small admission charge. For more information, call 806-2193. • One-Room Schoolhouse Reunion: On Sunday, Sept. 11, the West Monroe Historical Society on Route 49 hosts a One-Room Schoolhouse Reunion from noon to 4 p.m. The event is open to anyone who ever attended a one-room school anywhere. Participants are asked to bring a dish to pass, their own table service, and any photos or memories they would like to share. For more information, call 676-7414. • Brown Bag Luncheon: Bring your lunch to the Pulaski Historical Society on Maple Ave. from 11:30 a.m. to 1 p.m. on Wednesday, Sept. 14. Meet Northern Oswego County Ambulance (NOCA) Executive Director Norm Wallis and board member Dave Allen as they discuss the history of the organization. Beverages will be provided. • Antique Tractors and Engines: From Friday, Sept. 16 to Sunday, Sept. 18, enjoy two antique tractor and engine shows! In Bernhards Bay, the 14th annual Oneida Lake Ole Tymers Show begins at 8 a.m. at the David C. Webb Memorial Park on Route 49. For details, call 708-2214. In Sandy Creek, the 11th annual Crank It Up! event opens at 8 a.m. at the Oswego County Fairgrounds on Ellisburg Street. Admission is a donation. For details, call 387-5365. • Haunted History: On Saturday, Sept. 24, celebrate the haunted history of Casey’s Cottage at Mexico Point Park just off Route 104B from 7 to 9 p.m. There is a small admission charge. For more information, call 963-7657. Admission is free for all events unless otherwise noted.